I was bored the other day so I wrote a little AppleScript to automate the process of sharing a bunch of projects to a single destination. Basically it hits CMD-E, return, return, down arrow for the number of times you specify. You have to put your Projects in a collection or something and select the first one. Then tell Share-O-Matic how many times to repeat the action and get out of it’s way. Literally. It won’t stop until it repeats those keystrokes the number of times you specify. Seriously, it’s literally unstoppable, and kind of terrifying. Also you can’t do anything else while it chugs away. This is not a real batch exporter, it just queues all your Shares up for you. Start small and see how it works. It’s kind of useless if you only have a few projects, but if you have a lot, you can go have a cocktail while it presses buttons for you. 😉 However, If it destroys your computer and you lose all your work, I disclaim any responsibility. Use at your own risk. And feel free to share it if you find it useful. Here it is: Click Me! Track Tetris. If you’re an editor, you know exactly what I’m talking about. It’s a game we all play constantly while we work. I don’t really think about it. It’s just a part of the process of moving clips from a source – or within a timeline – into a section of the timeline containing other clips. I suppose I could’ve just said ‘editing’, but this is a very fancy blog. Like anyone, I prepare the timeline for each move or cut. Set rollers, patch the source tracks, lock tracks, move audio or video up or down to adjacent tracks, make new tracks etc. Once I’ve cleared the way, I move or cut in the clips. Usually it’s fine. But sometimes, I overwrite something I didn’t intend to. I lose the game. No biggie, hit undo and try again. Like I said… I never really gave it a second thought. 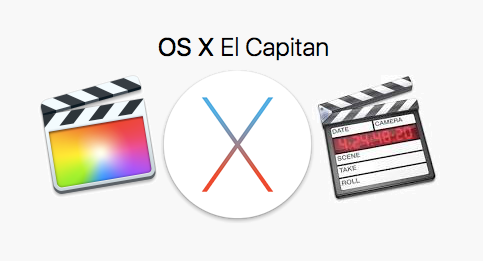 Then… I started using Final Cut Pro X. And the game changed. I’d be lying if I said it was easy. It wasn’t. Counting my years as an audio guy, I had over 2 decades of daily brain/muscle conditioning screaming that this trackless magnetic timeline thing was completely absurd. No tracks?! WTF!? However, being a glutton for punishment I persevered. And I discovered that it does work, quite nicely in fact. Yes, I still move things around in the timeline. But only when I want to, not because I have to. And I never need to move things out of the way. Mostly all I need to do is set my source I/O, select an in-point in the timeline, and press a key. Or grab some clips in the timeline and move them. 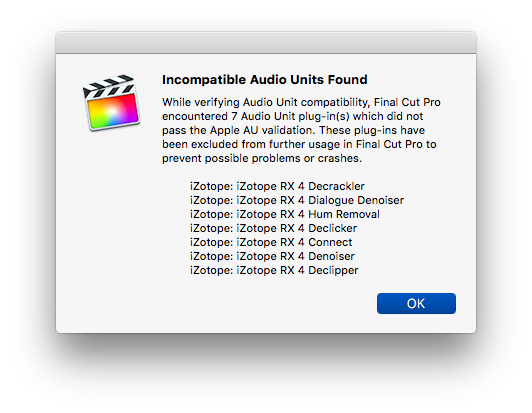 FCPX takes care of how it fits into the puzzle for me. I don’t clear the runway, I just land. 😉 If I don’t like the arrangement I can change it later. Right now, I can stay with the flow, in the groove, whatever you want to call it. So… why do we need tracks again? Tracks exist because they’re analogs for, uh… analog. Audio tape recorders, film projectors, videotape players… all these things pass media over a fixed head of some sort with which they need to be in perfect alignment. That paradigm carried over into the digital world. It made it easier to understand. But the change to a digital world is (mostly) done. We don’t need tracks for that anymore. What tracks are very good for, is visual organization in a timeline. 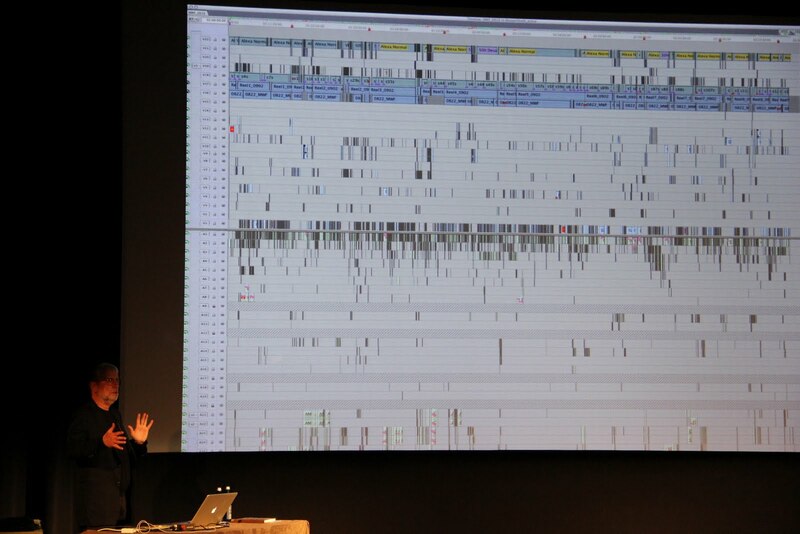 Walter Murch’s famous FCP “classic” timeline is the perfect example of that. 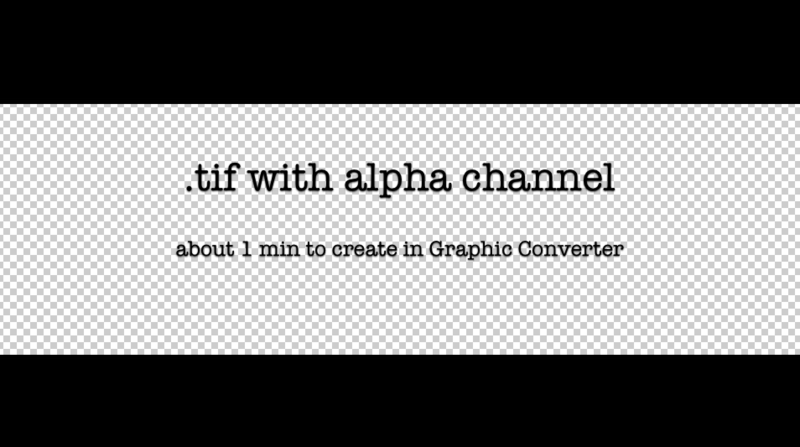 Could he do something like that in FCPX? Well… If he needed it to look like that he probably couldn’t. Although, I can think of some ways to approximate it, but it’d be like using popsicle sticks and glue to build a house or something. So how do you visually organize a timeline in FCPX? you ask. Secondary Storylines and Roles, that’s how. Admittedly, visual organization in the FCPX timeline needs some work, it’s far from perfect. But the foundation is there and it’s solid. Assign Roles properly, and you can see where everything is instantly. 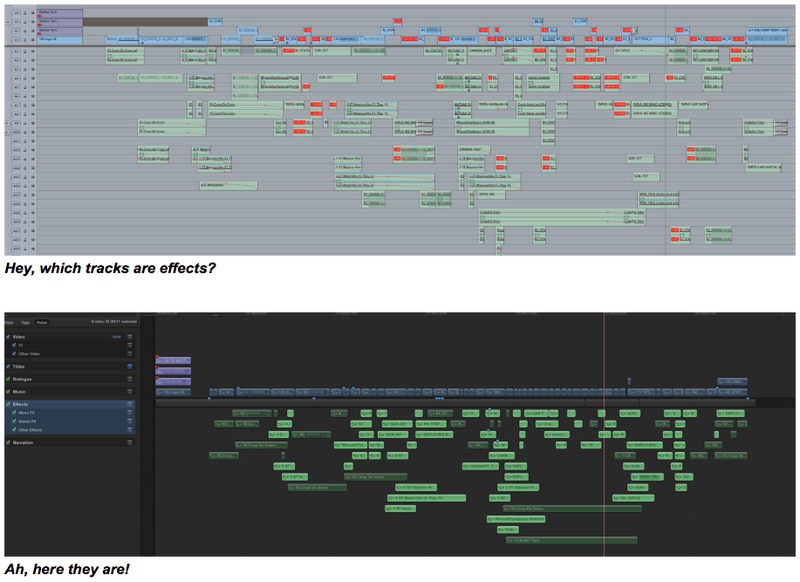 Maybe not how you’re used to seeing things, but not much about the FCPX timeline works the way you’re used to anyway. In fact, if you’re like me and are more concerned with fitting all your clips onscreen than carefully arranging things, FCPX works really well right now. I have no idea how Mr Murch was able to work in that timeline. He must have had a really big monitor! In 7, if I hadn’t cut it, I’d have no clue what any of those clips were just by glancing at the timeline. In X, select the desired Role(s) in the timeline index and there they are. Yes, you should be able to have clips with the same Role “stick” together. And preferably be able to choose where roles are placed vertically. VO at the top, then DIA, then FX, then MX or whatever you prefer. Once Apple figures that out, and I think they will, that will replace the last visual function that I think tracks still serve. Organizationally, Secondary Storylines can already do what tracks do, and they’re more flexible. If you have a clip or clips cut into little pieces, and you’d like them to stay together rather than magnetically flying toward the Primary Storyline, Stick ’em in a secondary. Voila! A track. A track that you can grab and put wherever you want it in the timeline. 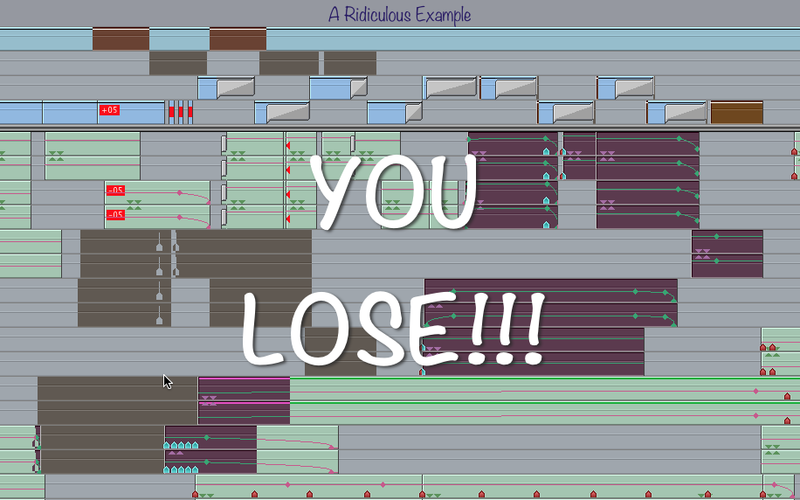 And if you connect your secondary to the first frame of the Project, all your little clips will stay right where they are in the timeline. They’re not connected to the Primary so they won’t unexpectedly move when you move clips in the Primary storyline. Great for Music beds and other things like that. I realize they don’t meet everyone’s needs, but for me, Roles and Secondaries can do much of what tracks did, and more. Even with their current imperfections. Combined with the Magnetic, Trackless Timeline, they allow me to just cut stuff without stopping to think about where it fits in the timeline. I can focus on what, not how. I like that.